CLASSICS is a new series that provides insight, life advice, and general words of wisdom from surfing’s most respected individuals. Gerry Lopez speaks very slowly. You can tell that he smiles through his words. Each is measured carefully before spilling out. He pauses mid-sentence often, and, in the course of a 45-minute conversation, I interrupt him a few times, thinking that he is done speaking. He isn’t. He is merely thinking about his words before he speaks, something that, surprisingly, is very rare. And although his words are slow, the content of them is not. His words have a presence – a quiet confidence bolstered by the fact that he knows exactly what makes him happy, and he has spent his life living the way he wants to. His influence on surfing is almost beyond comparison. 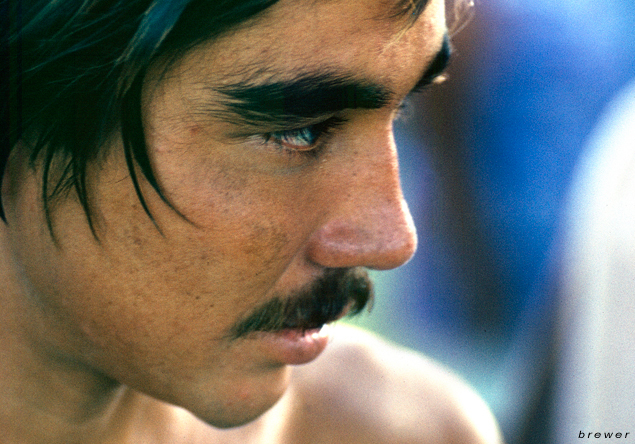 One of the first to master the Banzai Pipeline, Lopez’s style and casual approach to one of the most dangerous waves on earth struck a chord, and continues to do so today. Years spent searching for – and finding– perfect waves opened up the public’s eyes to whole new horizons. And yet, through all of it, his easy smile and quiet cadence remained the same. He is quick to impart the knowledge he’s gained on the road he’s traveled, but quicker to explain that there is more than one road for each of us. Here is some of the wisdom from his road. Jeez, in the early ‘60s, the Pipeline had already killed a surfer from Peru, so there was this specter about it. But, you know, a good wave is a good wave. If you had the chance and the space that we had back then, then you got to enjoy it. I had a long affair with the Pipeline. Twenty-five Pipe Masters events. I got to surf against guys that hadn’t even been born when I surfed in my first one. It was a spot that, I guess, I was intimidated with at first, but I got to know it, and eventually became pretty comfortable there. In the ’80s, if it hadn’t happened in the last two years, none of the surfers knew, or even cared, that it had happened. Now there’s been a trend, as time’s gone on, for a lot more interest. Guys want to know what it used to be like and who used to be there. I’m surprised that I’m more well-known now than I was in the ‘80s. My surfing was kind over then, you know? I’ve been married for thirty years. The key to a happy family is respect and appreciation for everything that they do. Life is all about relationships with people, and when you choose someone to spend your life with – if you really choose to do it – then you’re going to make it work. A lot of people, like in everything, don’t put the time or focus into making that happen. It’s a mutual thing. It’s a team. I surf as much as I can, but not as much as I used to. The longer you surf, the more you begin to appreciate that pretty much any wave will do. It’s not so much the actual ride as it just being there – just being able to get out there and go through the whole experience. If the waves aren’t that good, it’s still good fun. I still enjoy it as much as I ever did. I don’t think surfing’s ever boring. I’ve gone through different phases in my life, like when windsurfing came along. I mean, there was a while there where I didn’t even throw the surfboard in the car. I’d just throw the windsurf stuff in and go windsurfing all day. That gradually faded, and I’d start surfing more. With snowboarding, it was kind of the same thing. When we first moved over here to Oregon, I thought, “Man, this is better than surfing. There aren’t any crowds and the bottom turns are endless.” Eventually, the surf thing works its way back into my consciousness, and I realize that surfing is, always has been, and probably always will be, the foundation of who I am. It always comes back and reasserts itself. The first twenty years of surfing was just a test to see if I was really interested. Then the wisdom of all the lessons that I was learning started to reveal themselves. Surfing is one of the best metaphors for life. Out in the surf, everything’s moving; everything’s happening. It never holds still, and life’s the same way. It doesn’t hold still for you, either. If you don’t move with it, life, just like the wave, will pass you right by. You have to be paying attention; you have to be spontaneous; you have to be able to go with the flow. If you can’t… I don’t know, maybe you better find something a little more static. I got to work on Big Wednesday in the late ’70s. That was the first time anyone from the ’70s generation got to really see Hollywood. It was kind of a good thing. It was better than when Gidget came to beach in the ‘60s. That was totally bogus. You know, even though at the time Big Wednesday was kind of rejected by surfers, anyone who looks at it now thinks, “Oh man, that’s pretty authentic.” In a way, that’s kind of how it happened. That was best and most authentic try that Hollywood made at surfing. Everybody thinks surfing is the coolest thing in the world. In some respects it is, and in other respects… well, it’s not. The funniest guy in the world. Every once in a while, he’ll call up and leave a message. I wish I kept them all, because they’re hilarious. It’s a tough existence. Being a professional surfer is hard, but being a professional actor is even harder.